Good morning to you, Insiders, on a quiet morning in El Segundo. The Kings held an optional skate at Toyota Sports Center, and while there were no line rushes, there are still several notes to share that are pertinent to tonight’s game against the Tampa Bay Lightning (7:00 p.m. / FOX Sports West / KABC 790 / I Heart Radio). -Jonathan Quick appears likely to start for the second consecutive day. 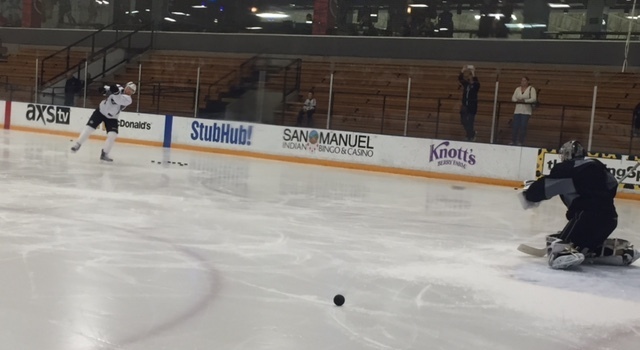 He left the ice well before Jhonas Enroth, who remained on for a bit of extra work. Derek Forbort also remained on the ice for a good amount of extra work, so no lineup changes will be projected. Expect to see Pearson-Kopitar-Gaborik, Lucic-Carter-Toffoli, Andreoff-Shore-Brown and Clifford-Weal-Nolan up front with defensive pairs of McNabb-Doughty, Muzzin-Martinez and Ehrhoff-McBain. Trevor Lewis, who suffered an upper-body injury during Friday’s practice and did not skate or play Saturday, did not take the ice. -Tampa Bay is not skating at Staples Center this morning. Andrei Vasilevskiy was already more likely to get the nod tonight, even before Ben Bishop was injured when a stick blade penetrated his mask and cut him during a 4-3 win in San Jose last night. Fortunately for the Bolts, Bishop should be fine and appears to be capable of backing up tonight, while Vasilevskiy, who stopped seven of eight shots in just over 11 minutes of relief action, will be expected to draw the start. Two of Vasilevskiy’s 22 career appearances have come against Los Angeles; the 21-year-old is 0-1-0 and stopped 44 of 48 shots in those match-ups, both of which occurred last season. The Lightning, who recorded a pair of one-goal wins over the Ducks and Sharks on their three-game California swing, don’t play again until Thursday, so there shouldn’t be a ton of deviation in the minutes Jon Cooper assigns despite the back-to-back that included some travel.